The number of concentrated animal feeding operations, or CAFOS, in Wisconsin has shot up in the past decade – as have concerns about their impact on water quality. About 12 years ago, Samantha Treml, right, then six months old, fell ill after being bathed in well water tainted by manure spread on a nearby frozen farm field. The Tremls moved from their Kewaunee County, Wisconsin, home after that incident, saying they no longer trusted the quality of their water. Recent tests in Kewaunee County funded by the state Department of Natural Resources found 34 percent of wells had unsafe levels of coliform, E. coli or nitrate. Late on a winter night in 2004 in Kewaunee County, six-month-old Samantha Treml was rushed to an emergency room, violently ill from bathing in water poisoned by manure spread on a nearby frozen field that seeped into the home’s private well. The rest of her family got sick, too. In 2014, seven people visiting Door County were sickened after manure from a large farm made its way into a home’s private water well. In 2015, Kewaunee County Board member Chuck Wagner discovered that the new $10,000 well he was forced to install two years earlier was again contaminated with viruses and cow manure. Wagner and his wife now use a reverse osmosis system to filter the water before drinking or cooking while they contemplate whether to dig a second new well. And this year, the Algoma School District is offering free water to residents whose wells are contaminated. In early March, a group of local residents asked the U.S. Environmental Protection Agency to provide emergency water for Kewaunee County residents with contaminated drinking water. “It’s astonishing, the number of people who can’t use their drinking water,” said Algoma School District Superintendent Nick Cochart, whose own well is polluted. 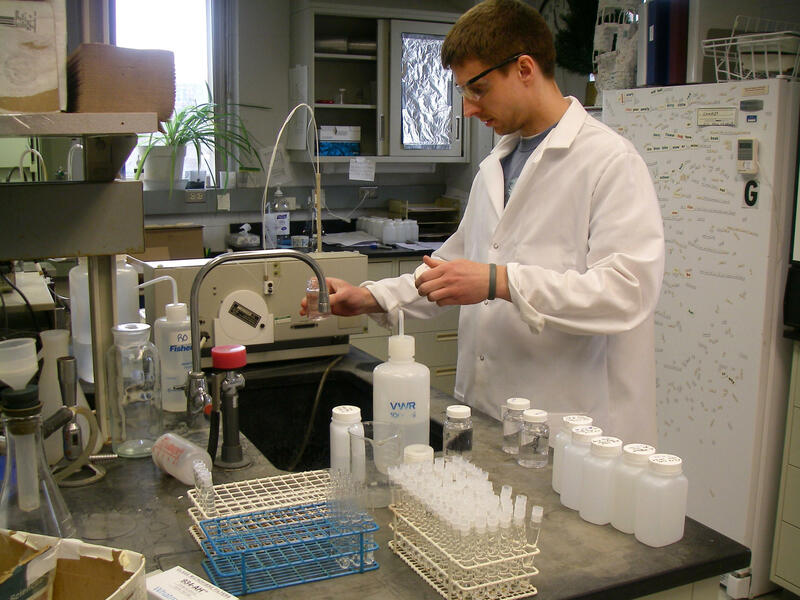 Brent Bednarek of the University of Wisconsin-Stevens Point’s Center for Watershed Science and Education prepares drinking water samples to test for bacteria. In some parts of Wisconsin, residents cannot drink the water because it is contaminated with bacteria from manure produced at large farming operations nearby. Between 2007 and 2010, an estimated 18 percent of 3,868 private wells in Wisconsin tested positive for coliform bacteria — an indicator of disease-causing bacteria, viruses or parasites — according to a 2013 study by researchers with the state Department of Health Services. That translates into as many as 169,200 of the 940,000 Wisconsin households served by private wells exposed to disease-causing pathogens. Most consumers are unaware of the danger; just 16 percent of private well owners in Wisconsin have them tested annually, the DHS study said. The problem also plagues municipal water systems where coliform bacteria accounts for most of the violations of health standards recorded each year. The 2014 Department of Natural Resources drinking water report on the state’s public water systems found 3.7 percent, or 420 of the 11,420 systems, had detectable levels of coliform. The report said those 420 systems serve about 92,290 people. Most of the violations, 351, were in small public water systems serving motels, restaurants, churches and campgrounds. Contamination by pathogens is of special concern because unlike pollution by metals or chemicals, pathogens can sicken people after just a single exposure and can be life-threatening to some people. Water runs off a field near the border between Kewaunee and Brown counties. The counties, parts of which have geology particularly susceptible to groundwater contamination, are home to several large dairy farms. 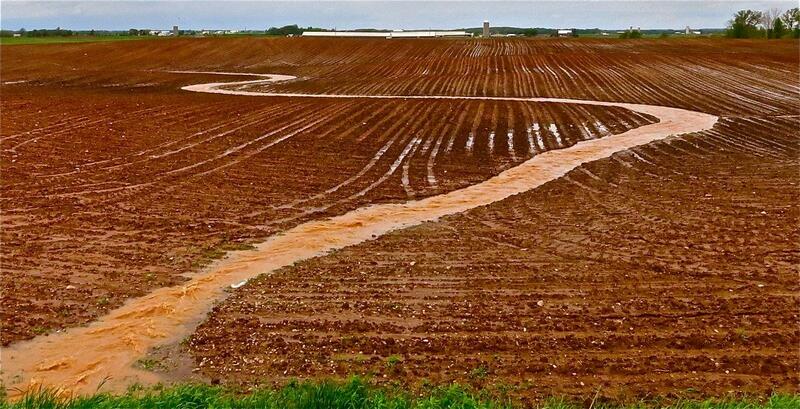 Dale Goodner of Algoma, who took this photo in spring 2013, says it illustrates how easily soil and manure find their way into our streams and rivers. Whether it was manure spread irresponsibly on a frozen field, a septic system compromised by pollution-prone geology or untreated municipal drinking water, incidents of pathogens in drinking water in Wisconsin have revealed weaknesses in government oversight of this most basic and necessary resource, the Wisconsin Center for Investigative Journalism found. Committees formed as a result of contamination in Kewaunee County recently proposed steps to better protect Wisconsin’s drinking water from agricultural pollution. These work groups, composed of farmers and residents and federal, state and local officials, were formed after Kewaunee County residents petitioned the EPA in 2014 for help with the county’s water problems. The recommendations included $300,000 for emergency drinking water and new wells, voluntary manure spreading restrictions, more DNR staff and better enforcement. But some residents and others remain skeptical the DNR will take meaningful action, and they criticize the agency for taking too long to address what some are calling a crisis. How bad is it? Recent testing funded by the DNR found more than one-third of the 320 wells tested in Kewaunee County were unsafe to use because of coliform, E. coli or nitrate. The second phase of the study will show the exact source of the pollutants. Chuck Wagner’s granddaughters, Mackayla, left, and Maggie DeBaker, pose with polluted well water from his Kewaunee County, Wisconsin, home around 2010. In 2013, Wagner had a new, deeper well drilled at a cost of $10,000. The new well has also become polluted with viruses from cattle manure, and he now uses a reverse osmosis system to filter the water before drinking or cooking. Wagner discovered in the most recent round of testing that his new well — which he built in 2013 to replace an old contaminated well — is now tainted by four bovine viruses as well as nitrate. Wagner, who served for 10 years on the state’s Land and Water Conservation Board, said clean water and agriculture can exist side by side, but DNR must take action. “We’re getting mad,” Wagner said. 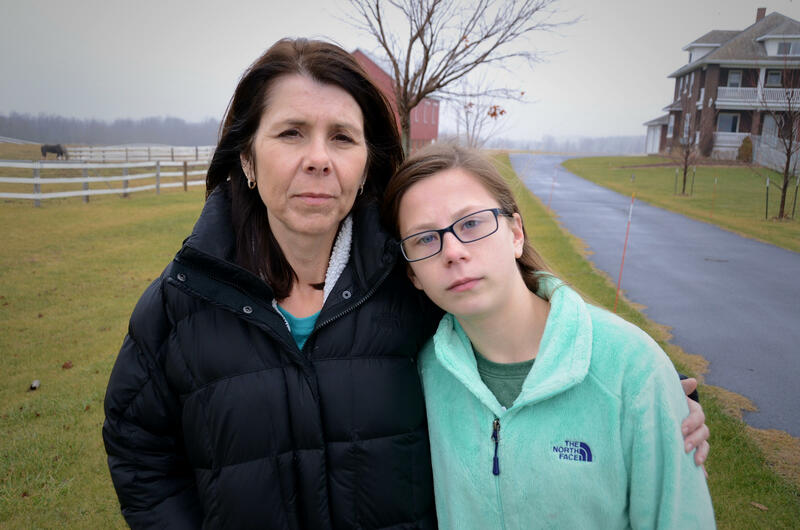 As for the Tremls, the family eventually was awarded an $80,000 settlement from the insurance company for Stahl Farms, which spread the manure that sent Samantha, now 12, to the hospital. The farm also paid a $50,000 fine to the state for violating its DNR permit. Treml said she believes her family’s move to Green Bay was the right decision. 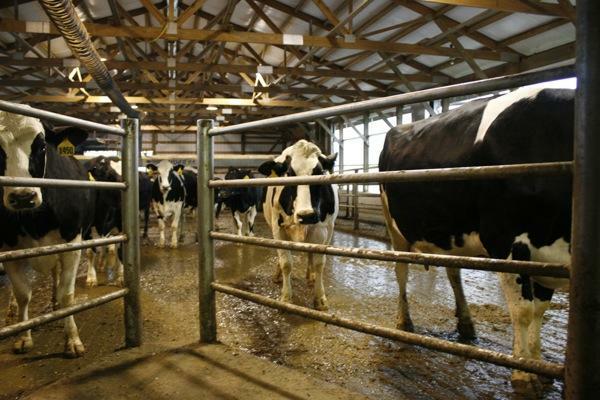 Manure from dairy cattle, like the ones seen here at a farm in the Darlington area, is one of the culprits in contamination of drinking water in Wisconsin. Although municipal water is regularly checked for bacteria, homeowners with private wells are responsible for testing the safety of their water. Other sources of bacteria include leaking septic systems. Kewaunee County is home to 20,574 people and 76,000 cows, according to county data. It has one of Wisconsin’s highest concentrations of large dairy farms, known as Concentrated Animal Feeding Operations or CAFOs. Such farms, which have up to 8,000 head of cattle, can produce as much feces as a city, and most of it ends up on nearby farm fields. Kewaunee County’s 16 CAFOs contribute the bulk of the more than 555 million gallons of liquid manure that are spread on the county’s fields each year, county figures show. The likelihood that manure from such large farms will contain one or more pathogens is “very high,” according to the EPA. These pathogens include E. coli, Salmonella, Giardia and Cryptosporidium. All can cause severe diarrhea and can be deadly for those with weakened immune systems as well as infants, young children and pregnant women — about 20 percent of the U.S. population. Legislation aimed at bolstering protections against manure pollution in areas with fractured bedrock, such as Kewaunee County, was introduced by Democratic lawmakers in January. The bill did not advance in the Republican-controlled Legislature. In the meantime, state Rep. Joel Kitchens, R-Sturgeon Bay, has introduced a bill of his own to raise the maximum household income from $60,000 to $90,000 under the Well Compensation Grant Program, which helps owners pay for replacement of wells contaminated by livestock feces. But he acknowledged the change is not a solution to the pollution problems. Three counties — Brown, Manitowoc and Kewaunee — have acted on their own, passing ordinances that restrict manure spreading in vulnerable areas. A study of the new county regulations, published in 2015 in the journal Resources, concluded the rules have caused “statistically significant reductions” in well contamination compared to other counties with fractured bedrock that used voluntary efforts. Those counties saw no improvement. Tim Trotter, executive director of the Dairy Business Association, the state’s most powerful dairy lobby, said farmers are serious about ensuring clean water. But they insist any new state regulations must take into account the impact on agriculture. “I think with any new rules there should be a balance between safety and being practical,” said John Pagel, who owns a large dairy farm and serves on the Kewaunee County Board. Lee Luft, a Kewaunee County Board member who is part of the DNR work groups, said residents will be watching the agency’s actions closely. The DNR’s seeming reluctance to address concerns about pollution from the big farms is not new, according to an April 2015 investigation by a group called the Socially Responsible Agricultural Project, based in the state of Oregon. The group’s “Rap Sheets” report documented a lack of DNR enforcement on large-scale farms in Kewaunee County going back to the mid-1980s. Using the DNR’s own records, the group uncovered dozens of instances in which large dairy farms violated anti-pollution laws with no follow-up to ensure problems were corrected. The agency disputed the report — saying it was enforcing the law to its fullest authority — but allegations of lax regulation continued to surface. In October, Midwest Environmental Advocates filed another petition, this time on behalf of 16 residents from across Wisconsin, asking the EPA to rescind the state’s authority to enforce discharge permits under the Clean Water Act if changes are not forthcoming. This report was produced as part of journalism classes participating in The Confluence, a collaborative project involving the Wisconsin Center for Investigative Journalism and University of Wisconsin-Madison School of Journalism and Mass Communication. The nonprofit Center (www.WisconsinWatch.org) collaborates with Wisconsin Public Radio, Wisconsin Public Television, other news media and the UW-Madison School of Journalism and Mass Communication. All works created, published, posted or disseminated by the Center do not necessarily reflect the views or opinions of UW-Madison or any of its affiliates. Manure has been blamed for much of the bacteria and viruses that pollute Wisconsin drinking water, but contamination from human waste is a problem, too. Failing septic systems, leaking public sewer pipes and landspreading of septic waste can introduce dangerous pathogens into both rural and urban water systems. In June 2007, 229 people were sickened by a norovirus in Door County while eating at a restaurant. Seven were hospitalized as a result of the pathogen, which is known for spreading illness on cruise ships. The source: a leaky septic system. Some inmates, staff and visitors at two Wisconsin state prisons say the water there is unsafe to use because of lead and copper contamination. At Fox Lake Correctional Institution, 55 miles northeast of Madison, about a dozen inmates told the Wisconsin Center for Investigative Journalism that the water at the 56-year-old prison is routinely yellow or brown with dark sediment and an unpleasant flavor. For the past six years, Michael Schnur and his family have been drinking bottled water. Already concerned that pollutants from the coal ash landfill near his home in Sheboygan County might be leaching into his private well, Schnur became even more fearful last year when he received a letter from the state Department of Health Services. It warned that elevated levels of a little-known, unregulated element — strontium — were found in his drinking water.